As you may have read in the news or seen on Dateline, Ominous Mountain State University’s counseling services have come under some scrutiny for alleged callousness, reliance on unproven therapeutic techniques and general incompetence. We recognize that granting too much autonomy to our counsellors resulted in uneven, even dangerous, care. Roommate issues? Talk to us and her boyfriend who “visits” all the time won’t be coming around anymore. Is it a personal hygiene issue? Talk to us and the floors will sparkle and your room (and roommate) will smell like a dewy field beside a crystal clear mountain stream. And you better believe that nobody will be stealing your gabagool from the dorm pantry’s fridge if you let us know about it. Are your parents pressuring you into a career you don’t like? Don’t be surprised if they can’t berate you in person because of some mysterious tire problems. Study Comparative Gender Norms in peace. Besides, we have some connections in the construction industry if you’re really hard up for work. If you’re feeling depressed, we’ll take you to the dog track. That’s how much we care. Many students today come to school counseling with debt issues. If you signed up for every credit card offer that came with a free beer coozy and find yourself in over your head, we’ll even reconsolidate your debt. Will we ever! How do we do all of this? Pay no mind, kiddies. Just know that we expect you to show some gratitude for our help by doing some “community service.” Really, it’s no big deal. Happy Columbus Day and have a mentally stable semester! 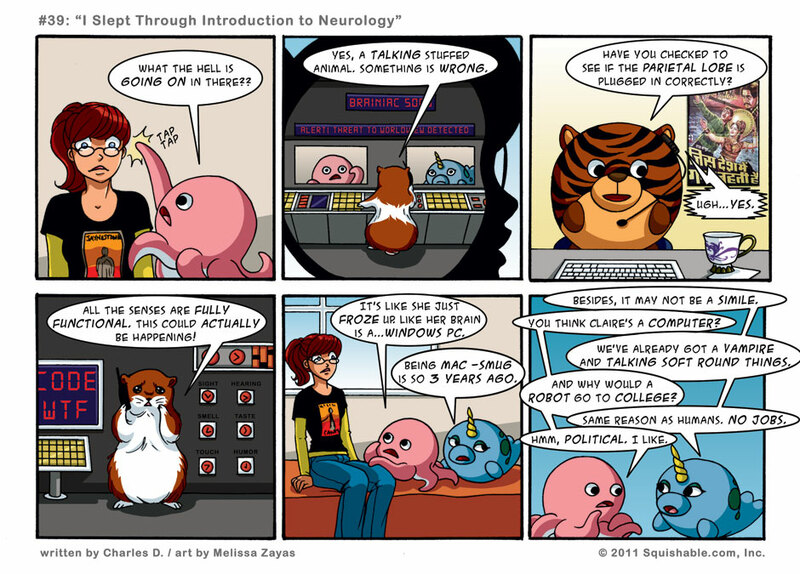 Cute aminals, Windows bashing, and academia bashing. I’m in love. Love how Otto thinks her brain is acting like a PC. Take THAT PC users!! Plus this just ruined all those cuddly moments between Claire and Otto at the beginning of the series. Sit tight – all will be revealed. I love Tech Support Tiger! Also this is deeply hilarious. Even robots can be full of love for their Squishy friends! How did I miss the shirt on Monday? Also, it’s a real shirt! (Found it on Think Geek). Who else thinks Tech Support Tiger should be given a bigger role? Totally. I imagine Tech Support Tiger taking a Q like position, explining how to use fantastic gadgets and cars equipped with parachute ejection seats. A talking stuffed animal: something is wrong. A talking hamster controlling a college student? Something is even wronger. Is that even a word? Ehh, no. This has to be one of the best ones yet! There is so much creativity that went into the “computer” (and it’s run by the most adorable of hamsters, of course), then the stabs at PC and Apple, tying in the Tech Tiger (who appears to be somewhere in Asia, only fitting) again, and as always, fantastic commentary. Thanks guys, we love it! !